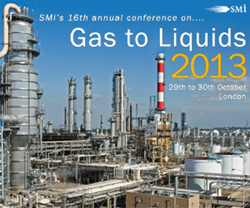 SMi's 16th annual Gas to Liquids conference, taking place on 29-30 October in London, features a vast array of GTL project updates from across the globe. This year’s programme will address how those at the forefront of the GTL progress have adapted to various technology challenges and new business opportunities, as well as revealing valuable lessons learnt from current and emerging GTL projects. Sasol North America is currently issuing contracts to help build a $16–$21 billion GTL plant in Louisiana which could produce up to 96,000 b/d of naphtha and diesel. Interestingly, plans are also underway to build mini-GTL plants requiring a fraction of the investment required for larger plants with companies such as Velocys and CompactGTL pursuing this opportunity. The motivation behind mini-GTL plants is that they enhance opportunities in other countries where many natural gas sources around the world are too small to support larger facilities. Additionally, Shell have recently announced that improvements to their proprietary GTL technology has reached a point where it can achieve 50% gains in throughput volumes compared to its giant Pearl GTL plant in Qatar which came on stream in 2011. Shell has been looking to replicate the success of its massive Pearl GTL project to tap booming volumes of low-cost US shale gas with a similar scale GTL export plant on the US Gulf Coast. Against this backdrop, SMi’s 16th annual Gas to Liquids Conference and Exhibition will address these recent developments and more through a series of project updates, case studies, technology sessions, and interactive panel discussions. An array of GTL innovators speaking at the event includes Sasol North America, Chevron Nigeria, BP, Exxon Mobil, OLTIN YO’L GTL, Velocys, CompactGTL and Axens, among others. The meeting will provide the perfect platform for discussion and debate on the latest hot topics affecting the industry such as: shale gas reserves reshaping and providing opportunities for the GTL market, new technologies being proven at scale like the Fischer-Tropsch process, and new projects from an array of GTL giants. To view the full speaker line-up and completed conference programme, visit http://www.smi-online.co.uk/2013gtl24.asp. SMi Group invite all workshop and conference delegates, speakers and sponsors to join them for a networking welcome drinks reception at 5.30 p.m. on 29th October 2013. SMi Group invites you to join them for a post conference dinner reception following the end of the first day. Dinner will be held at Bombay Brasserie where you will have the extended opportunity to network with industry professionals. Leave GTL 2013 having forged new working relationships while strengthening current ones.